Kendal Alexander has the role of Dasher the reindeer in the Ackerman School holiday performance. For seven years, Ackerman School music teacher Anthony Volkman has spent his summers creating the school's annual holiday program on a budget likely to make The Grinch flinch. 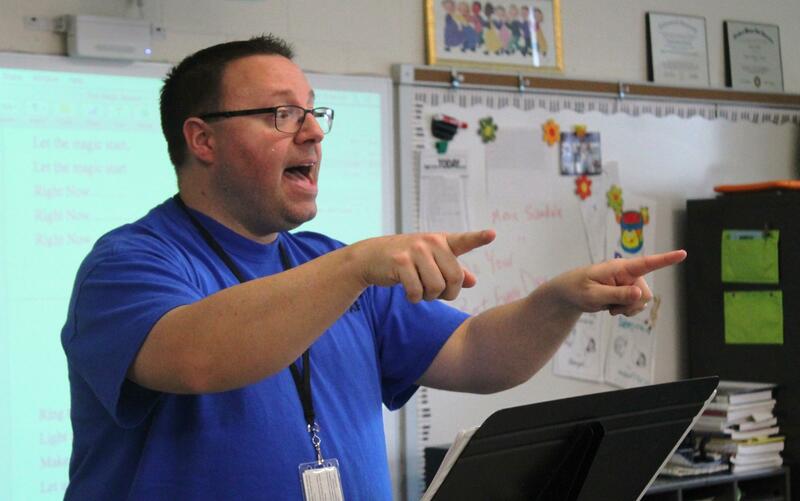 Anthony Volkman has been teaching music at Ackerman School since 2009. But this year, the program will be more elaborate, thanks to a $3,000 grant from the Maritz marketing company. It's not a huge amount — enough for props for kids in wheelchairs, professional lighting and more microphones — but the impact on the kids in this K-8 Special School District building in Florissant is incalculable. A quarter of the 160 kids at Ackerman are on the autism scale. Many have sensory issues. St. Louis Public Radio's Nancy Fowler drops in on a rehearsal of North Pole Follies at Ackerman School in Florissant. 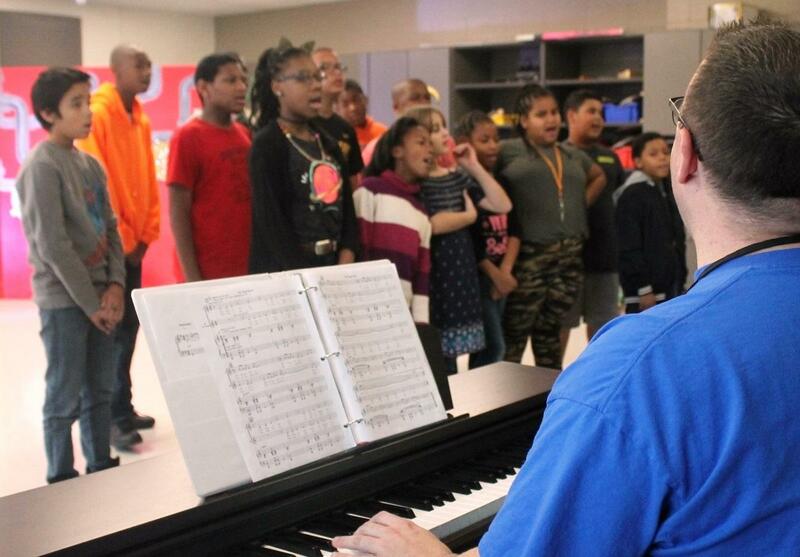 Teacher Anthony Volkman rehearses a song about snow with a dozen Ackerman School students. Four years ago, 12-year-old Clifford Swan wasn’t at all sure about his first pageant. Clifford Swan, 12, plays an elf in this year's Ackerman School holiday songfest. He says he feels gets a lot of love from the audience. But Clifford managed his way through the part. Now with the approach of this year’s event, called “North Pole Follies,” he feels like a veteran. Fifth-grader Kyla Dotson also looks forward to this year’s production. “Mr. V always has us pumped up about what we’re going to do,” Kyla said. 12-year-old Kyla Dotson looks forward to bringing out the feminist side of Mrs. Santa Claus. "It just shows that women need a little respect, not just cleaning up the house and cleaning up after men or after anybody,” she said. 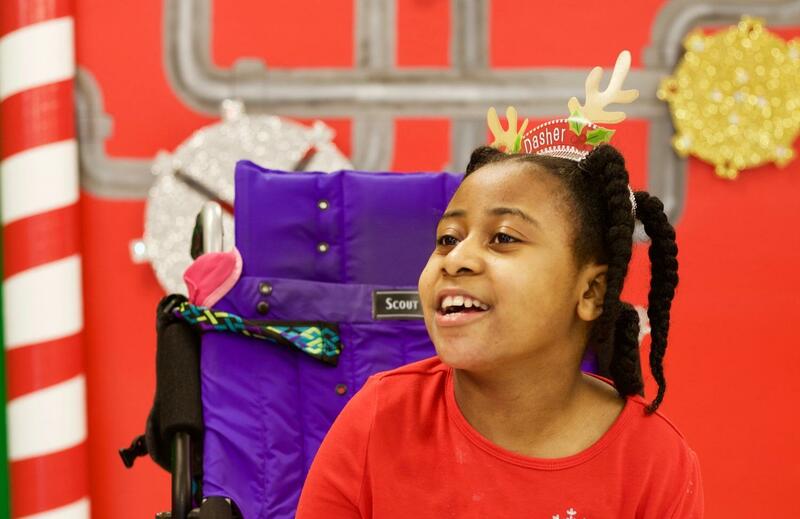 For Kyla, this pageant is more than a holiday event; it’s a pathway to her future. “I want to be a Broadway star,” Kyla said. The annual holiday pageant, to be held Dec. 15, reflects the year-round mission of Ackerman School, Principal Kelly Grigsby said. Teachers help these Ackerman students to do the spins and turns of this reindeer routine. Even kids who don’t feel comfortable on stage or in crowds still participate in the pageant. Volkman will record a small group singing a sleigh-ride song and show the video as part of the performance. 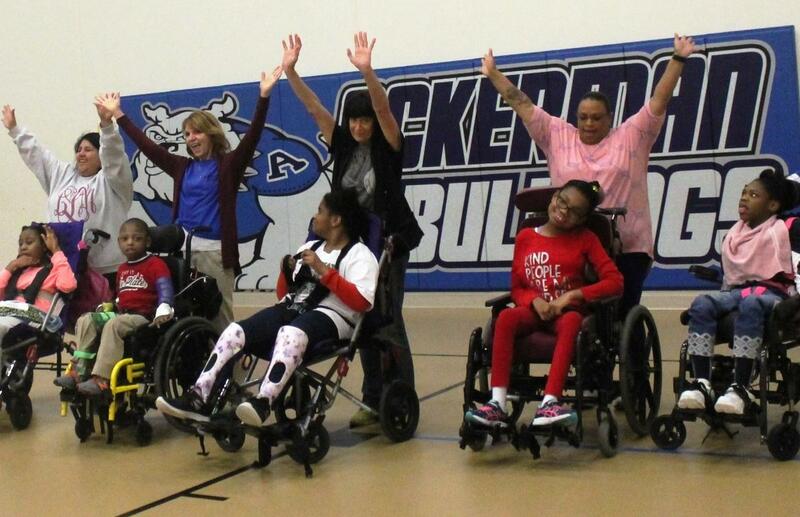 Ackerman kids who use wheelchairs are the stars of “Blitzen’s Boogie.” Until this year, the songs were mostly tried-and-true favorites like “Frosty the Snowman” but because of the grant, the school was able to pay royalty fees. Andre Alexander is excited to see his daughter Kendal on stage. With the help of teachers, the kids in “Blitzen’s Boogie” spin around in their chairs, and in and out of formation. Andre Alexander’s 11-year-old daughter Kendal is part of the rousing number. When the big day comes, Alexander will see his daughter onstage, in costume, for the first time. 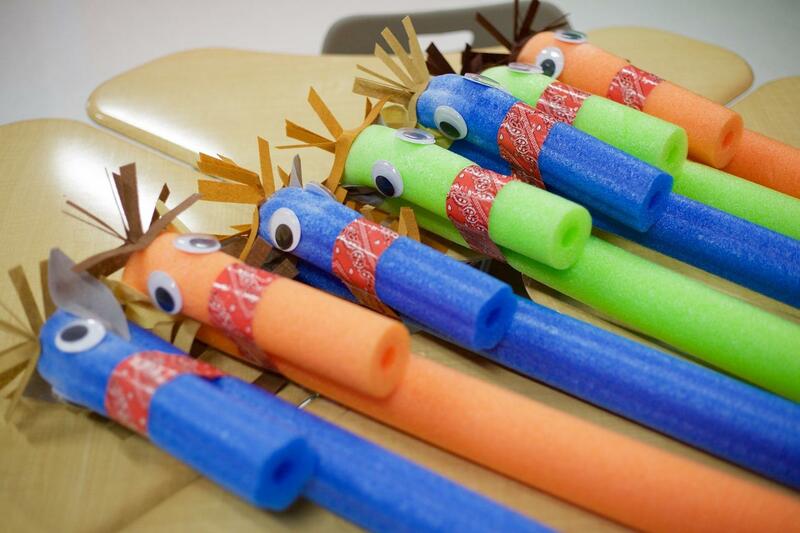 Props for Ackerman's North Pole Follies include these horses made from pool noodles for a Holiday Hoedown number. When it comes to supporting people with developmental disabilities through art-making, the activities are much more than just a pastime. For some in St. Louis, being creative helps them buy food, or get a job. Those are goals – and outcomes – of a St. Louis-area organization called Artists First. But budget cuts are jeopardizing the nonprofit, forcing some hard decisions. Many kids with severe autism can’t speak their minds. But when they communicate their thoughts and feelings through paint, paper mache, tin foil and beads, it can be a work of art. 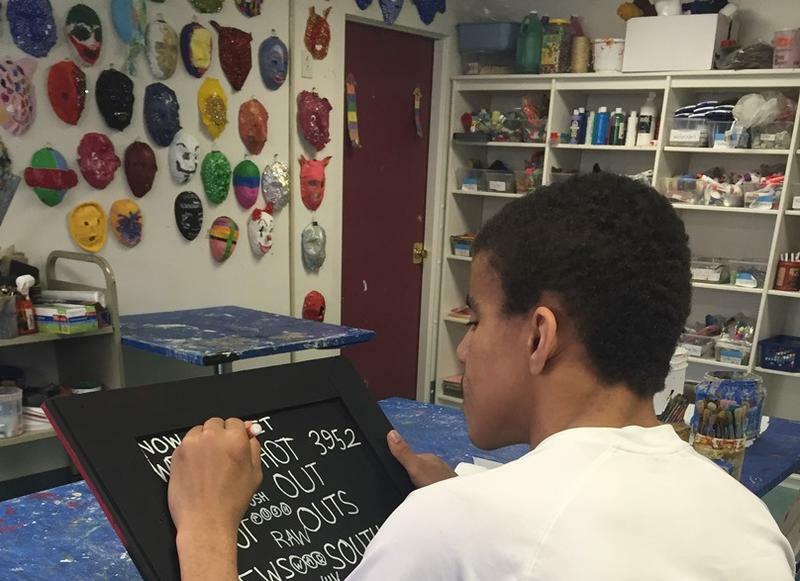 Art by kids with autism is on display through June 6 at Cherokee Street’s beverly gallery, in a show called "Double Rainbow." The artists are students of Giant Steps, a private school for children, teenagers and young adults up to 21, who have autism.